Jews celebrate Rosh Hashanah on the first day of the Hebrew month of Tishrei, in September or October. It is the first of the Jewish High Holidays, and, according to Jewish tradition, marks the anniversary of the creation of the world. The phrase Rosh Hashanah literally translates to "Head of the Year." Rosh Hashanah occurs on the first and second days of the Hebrew month of Tishrei (which usually falls sometime in September or October on the secular calendar). As the Jewish New Year, Rosh Hashanah is a celebratory holiday, but there are also deeper spiritual meanings tied to the day. Rosh Hashanah, A.K.A "Judgment Day"
The Hebrew word for "sin" is "chet," which is derived from an old archery term used when an archer "misses the mark." It informs the Jewish view of sin: all people are essentially good, and sin is a product of our errors or missing the mark, as we are all imperfect. A critical part of Rosh Hashanah is making amends for these sins and seeking forgiveness. Teshuvah (literally "returning") is the process by which Jews atone on Rosh Hashanah and throughout the Ten Days of Awe. Jews are required to seek forgiveness from people that they may have wronged over the past year before seeking forgiveness from God. Teshuvah is a multi-step process for demonstrating true repentance. First, you must recognize that you have made a mistake and genuinely desire to change for the better. You must then seek to make amends for their actions in a sincere and meaningful way, and finally, demonstrate you have learned from your mistakes by not repeating them. When a Jew is sincere in his or her efforts at Teshuvah, it is the responsibility of other Jews to offer forgiveness during the Ten Days of Awe. The essential mitzvah (commandment) of Rosh Hashanah is to hear the sounding of the shofar. The shofar is generally made from a hollowed out ram's horn that is blown like a trumpet on Rosh Hashanah and Yom Kippur (except when the holiday falls on a Shabbat, in which case the shofar is not sounded). There are several different shofar calls used on Rosh Hashanah. The tekiah is one long blast. The teruah is nine short blasts. The shevarim is three blasts. And the tekiah gedolah is a single long blast, much longer than the plain tekiah. 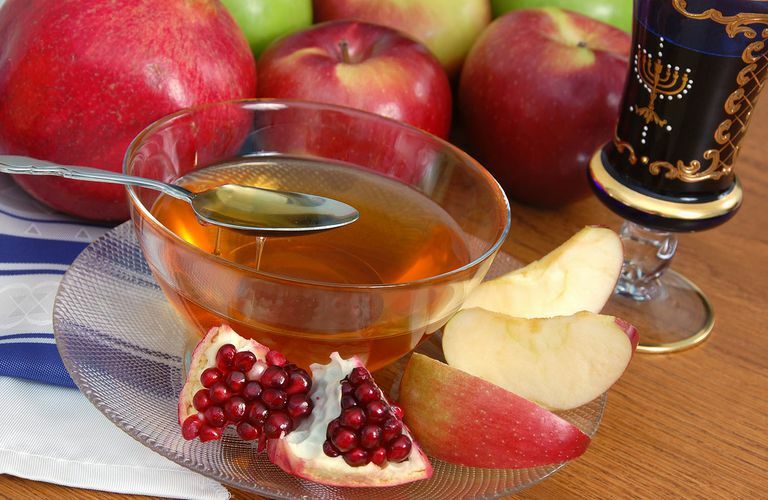 There are many Rosh Hashanah food customs, but the most common is the dipping of apples into honey, which is meant to signify our wishes for a sweet new year. A festive meal shared with family and friends to celebrate the New Year is central to the Rosh Hashanah holiday. A special round loaf of challah, which symbolizes the cycle of time, is generally served and dipped in honey with a special prayer for a sweet new year. Other foods may also be traditional, but they vary widely depending on local customs and family traditions. The traditional Rosh Hashanah greeting appropriate for Jewish friends on Rosh Hashanah is "L'Shana Tovah" or simply "Shana Tovah," which loosely translates as "Happy New Year." Literally, you are wishing them a good year. For a longer greeting, you can use "L'Shana Tovah u' Metukah," wishing someone a "good and sweet year." On Rosh Hashanah, many Jews may follow a custom called tashlich ("casting off") in which they walk to a naturally flowing body of water such as a river or stream, recite several prayers, reflect upon their sins over the past year and symbolically cast them off by throwing their sins into the water (usually by throwing pieces of bread into the stream). Originally, taschlich developed as an individual custom, though many synagogues now organize a special tashlich service for their congregants to perform the ceremony together. Why Is the Shofar Blown on Rosh HaShanah?